The following questions and answers are based upon our research and clinical practice for the last 40 years. Some of them may be different from what is usually supported by other academic associations and societies. A: Fibromyalgia is a disorder characterized by widespread pain. According to the clinical criteria from the American College of Rheumatology, the diagnosis of fibromyalgia is made when a person has tenderness at 11 of 18 specified tender points and suffers from pain for more than 3 months. 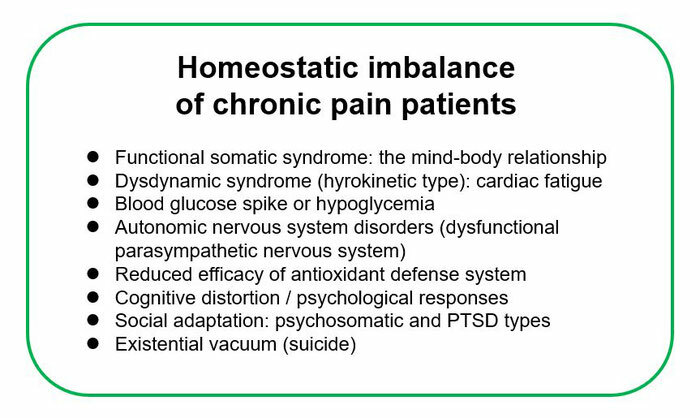 The diagnosis criteria does not include causes of pain. underlying medical conditions that cause pain. Causes of acute pain are usually relatively clear. They can be injuries, burns, or cancers, for instance. 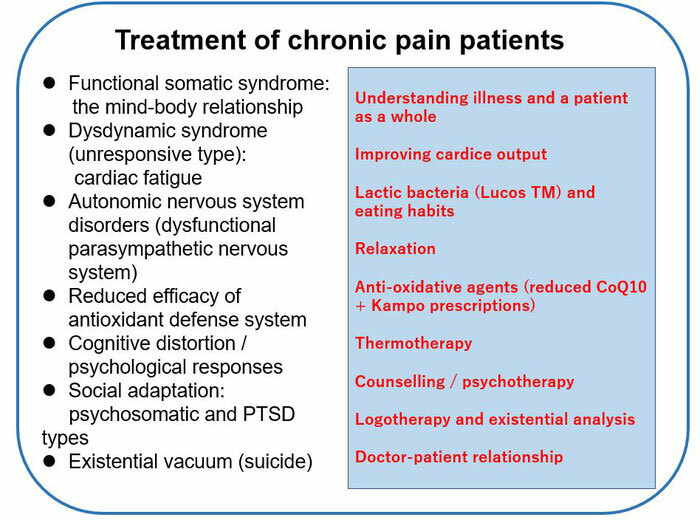 Similarly, there are contributory factors in cases of chronic pain. Examples are poor blood circulation, hypoglycemia, thyroid diseases (e.g. 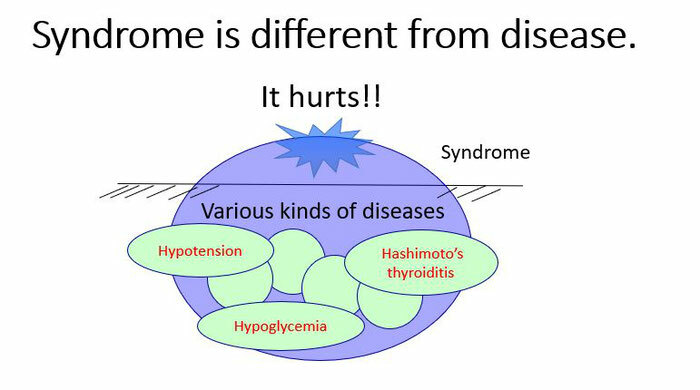 Hashimoto’s thyroiditis), and arteriosclerosis. Therefore, reducing pain is not enough. Treatment of pain cannot be genuine unless what underlies the pain is identified and treated. FMS is often said to be idiopathic because responsible factors do not necessarily lie in a single cell or organ. It is an unhealthy lifestyle of a patient that causes FMS. Lifestyle is the collection of biological (body), psychological (mind), social (environment) and existential (meaning of life) factors. People who have health problems and psychological trauma are more likely to develop FMS. Since pain is processed in the brain where various kinds of information and memories are stored, painful sensations and memories of pain mix in the brain. As a result, painful sensations are interpreted as being more intense than they really are. This is what patients are suffering from. Body and mind are interacting. Therefore, treatment will not take effect unless both the body and mind of a patient are treated at the same time. Q: Why is fibromyalgia considered syndrome rather than disease? A: Fibromyalgia is not called fibromyalgia disease. 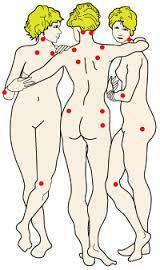 Anyone suffering from widespread pain may have fibromyalgia. It is syndrome because it is a collection of various somatic symptoms. It often coexists with numerous medical problems, including orthostatic hypotension, hypoglycemia, and Hashimoto’s thyroiditis. Apart from pain, people with fibromyalgia suffer from a variety of symptoms, depending on their condition. Q:　What causes pain to spread out over a large area? A:　Insufficient blood flow and reduced efficiency of metabolism cause pain-producing substances to build up in muscles. Accumulated pain-producing substances excite nerves, sending pain signals to the brain. Pain signals awaken memories in the past, making the brain overreact to the pain sensations. Q:　I wear more than a pair of socks at a time and use a hand warmer in winter. But it doesn’t help to warm myself. Are there people like me? A: Yes. There are people who have an abnormal sensitivity to a cold environment and cold temperatures. Their heightened sensitivity makes them chilled to the bone easily, for instance, in an air-conditioned office and on a cold day in winter. This is cold intolerance and more likely to be found in people with FMS and/or hypotension. It can be eased with medications that have warming effects. Kampo products are often used. You may also need to change your diet. In addition, it is important to control room temperature. Putting spa powder in a bath also helps. While having a bath, you can feel the effects of hot water and water pressure. The combination of heat and water pressure helps reduce your pain. A long soak in a mildly hot bath is recommended. Before you get out of the bath, you should cool down from your feet to the upper body with a cold shower. Be sure to keep yourself warm afterwards. Q:　I’ve talked to my friends and family about my pain, but they don’t seem to understand it really hurts. If I stop talking about my pain, would it distress me? A:　Yes. It would cause you a lot of heartache and a feeling of isolation, and you may be unable to express yourself. It is agonizing you have nobody to talk to about your pain. So, visit our patient support group and meet the members who have similar experiences. Fibromyalgia is curable. Correct diagnosis and right treatment make it possible for you to recover from the illness. It is functional illness, not organic disease such as cancer and myocardial infarction. It is not fatal. However, some people with fibromyalgia kill themselves because their pain is rarely understood properly, and they suffer mental torment. You should never let it happen to you. The key to prevention is to have proper knowledge of the illness. Q:　Can anyone develop fibromyalgia? A: No. Not everyone develops fibromyalgia. Fibromyalgia is the result of one’s constitution, lifestyle, and physical or emotional trauma working together. In other words, fibromyalgia is one of lifestyle related diseases. You can manage and even prevent fibromyalgia by exercising regularly, building up physical strength, changing the way you live and taking action to fulfill the meaning of life. Q:　Can fibromyalgia be cured? A:　Yes. It is curable if diagnosed correctly and treated appropriately. Self-care also helps to improve the quality of life. Many of our patients were able to recover from the illness and return to a normal life in this way. They all have realized their full potential. Q:　I often drink alcohol to ease pain. Is it harmful? A:　If you have hypotension, it is very harmful because alcohol causes a sudden drop in blood pressure. If you have hypoglycemia, risks of falling down and even losing consciousness increase because of the decreased tolerance to alcohol. 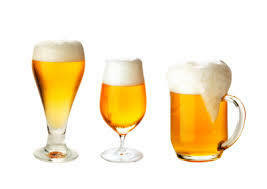 We recommend that you stop drinking alcohol until the causes of and treatments for your pain and symptoms are determined, and until you build up your strength again. Otherwise, alcohol consumption is risky. Q:　I had aches and pains for years, for which I never received treatment because they subsided gradually. Do I have fibromyalgia? A: It may or may not be fibromyalgia. We make a diagnosis after an interview and a series of tests. If you are concerned about your pain, you should come to our clinic or see a specialist in your locality. Q:　I have never heard of fibromyalgia. In which department can I find a doctor? A:　You can often find specialists in the departments of general internal medicine and psychosomatic medicine. Japan Fibromyalgia Support Association and Japan College of Fibromyalgia Investigation provide more information on their websites. Q:　I have autonomic nervous system disorders, and have been taking anti-depressants, anti-epleptic and anti-anxiety drugs for years. Do these drugs have side effects? A:　Anti-depressants, anti-epleptic and anti-anxiety drugs can cause low blood pressure if taken for a long time, meaning they affect blood circulation. Side effects occur at a high rate, and therefore it is difficult to withdraw from the medications. You should create a lifestyle that helps to reduce your dependency on medications. Q:　I’ve been under stress at home and work. Does it affect my pain? A:　People with fibromyalgia tend to be nervous and tense all the time because of their sensitivity. The interaction between pain and stress in the brain causes them to experience the pain with greater intensity. You should find a way of relieving stress before your pain worsens. Some people with fibromyalgia have experiences of maltreatment and/or bullying in their childhood. Stressful events like these result in psychological trauma, which helps to increase the severity of pain. Trauma is best treated by letting patients release their pent-up feelings. To make it happen, our clinic offers various activities, including Tai-chi, music therapy and peer counselling organized by the patient support group. Professional counselling is also available. Using psychotropic medicines is never enough to treat trauma. Q:　Though I have difficulty getting up in the morning, I often force myself to go to work. Will it cause any harm? A:　Yes. It will have an adverse effect on you. Because of a strong sense of responsibility, people with fibromyalgia often push themselves to the limit. It may lead to the exacerbation of their symptoms. You should take a plenty of rest, and see a specialist. Q: I often experience dizziness. Is it not caused by anemia? A:　Dizziness can be caused by anemia. However, people with fibromyalgia tend to have hypotension and even hypoglycemia, both of which can trigger light-headedness. Medical tests are needed to identify what causes your dizziness. Some people develop fibromyalgia because of anemia (iron deficiency anemia), but hypotension and hypoglycemia are more likely to be the causes of fibromyalgia. Q:　What are the symptoms of hypoglycemia? A : Hypoglycemia can occur in people who have never been prescribed diabetes medications or insulin. Common symptoms are postprandial sleepiness, postprandial fatigue, headaches, palpitations, sweating, numbness in the arms and legs, irritability, anxiety, inability to concentrate, forgetfulness, and convulsions. Underlying causes of hypoglycemia include unhealthy eating habits, including skipping breakfast and/or other meals, gorging, having no time to eat, and food preferences. Q:　How can a hypoglycemia diagnosis be made? A: The 75g oral glucose tolerance test (75g OGTT) is used. The test takes about 3 to 5 hours. First, you drink a sugary liquid. Then, your blood samples are taken to measure the levels of blood glucose and insulin at different time points. The levels of insulin antibody and glucagon may also be measured. We will make a diagnosis based upon the results of your blood glucose and insulin levels. Alternatively, you may have a sensor attached to the skin, which allows the blood glucose level to be monitored around the clock for 2 weeks (Free Style Libre Pro). Q:　Do people with hypotension have hypoglycemia? A:　Hypotension can coexist with hypoglycemia in 93%. The mechanism has not been fully understood. However, hypoglycemia seems to develop if hypotension is left untreated for a long time. An accurate diagnosis is necessary. Q:　Is hypoglycemia a serious condition? Should I see a doctor? A:　Hypoglycemia can become life-threatening if untreated. The brain relies solely on glucose as its energy source (another possible source is medium chain triglyceride). Therefore, hypoglycemia causes damage to the brain function. Untreated hypoglycemia may even increase the risk of falling into vegetative state. Early diagnosis and treatment are indispensable. Q: Does fibromyalgia cause the loss of appetite and interest in food, and apathy? A:　One of the symptoms is the loss of appetite. You may also become careless and feel anxious about your inability to function properly. It is essential to see a doctor and get an accurate diagnosis. Proper treatment based upon a correct diagnosis helps to relieve these symptoms. Q:　I was diagnosed with clinical depression. Are the symptoms of depression similar to those of fibromyalgia? A:　Yes. Fibromyalgia is difficult to diagnose, and tends to be mistaken for clinical depression or schizophrenia when the symptoms get worse. Specialists can tell you what causes your symptoms. You should find a doctor who listens to and cares about you. Somatic diseases, if mistaken for mental disorders, are called pseudo-neurosis. Typical examples are fibromyalgia, hypotension and hypoglycemia. Pseudo-neurosis is created by misdiagnosis. Disease needs to be diagnosed correctly. Q: What will happen if the symptoms of fibromyalgia worsen? A:　Fibromyalgia can result in myalgic encephalopathy / chronic fatigue syndrome (ME / CFS). ME / CFS causes a variety of symptoms, including pain, fatigue and sleep disorders. Hypoglycemia is also one of the symptoms, and can damage the brain. Damage to the brain leads to neurological symptoms, such as cognitive difficulties, memory loss, and convulsions. Q:　Because of my pain, I saw internists, orthopedics surgeons, gynecologists, ENT specialists (otolaryngologists), and dentists. However, none of them was able to tell me what had caused the pain, which made me mistrustful of doctors. Is my pain caused by stress? A:　Chronic pain is the result of an unhealthy lifestyle. Your attitude towards life is mirrored by your lifestyle. Stress (trauma) is likely to be one of the causes of pain. It may help to increase your pain. You should try to understand your pain and learn to change your lifestyle. Our support group is always ready to help you. Q:　Can the diagnosis of fibromyalgia be made by measuring blood pressure? A:　Fibromyalgia cannot be diagnosed without various tests, including a tender point exam and the head-up tilt table test. An evaluation of blood pressure is the most significant of all. The head-up tilt table test allows us to measure your blood pressure 3 times while you lie flat on the table, and 5 times when your body is raised to a head-up position. A special monitoring equipment is used (Paramatec GD303s). Q:　What helps to relieve the pain? A:　Pain is cured if the cause of pain is investigated, identified and treated. To make it happen, you need to understand your condition, first. Then, you should figure out problems in your lifestyle that may contribute to your pain. Based upon the evaluation of your condition and lifestyle, we will prescribe medications. We usually use drugs which help to increase blood pressure and which improve the pumping action of the heart. In addition, we employ various treatment methods to reduce pain, including nerve blocks, acupuncture, Kampo prescriptions and breathing exercise. Psychotropic medications (e.g. antidepressants and antiepileptic drugs) are not prescribed, except when they are considered to give patients far more benefits than side effects. Narcotics are not used, either. Causal treatment should be given. You should not depend on medications if you want to be freed from pain and realize your potentials. You need to know your condition and receive right treatment. Treatment is tailor-made for each patient. Q:　I always feel fatigued. 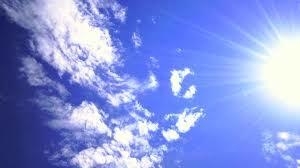 Having a long sleep does not help me to refresh myself. What can I do to improve my condition? A: You are always under mental and physical stress because of your pain. It is necessary to relieve the stress. Trauma can aggravate your condition. Inadequate pumping action of the heart also hinders you from getting better. It is indispensable to receive right treatment for a sufficient period of time. Most of the FM patients suffer from insomnia due to hypoglycemia a meal before sleep and taking Ractic Bacteria (Lucos TM) prevent insomnia. Q: I am an outpatient. I am taking 10 prescriptions, but I don’t know which one is working on me. What should I do? A: You should consult your doctor about reducing medications. Taking multiple medications doesn’t always benefit you. 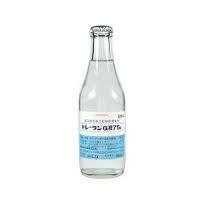 Besides, some medications must be discontinued only gradually. Some of them even have rebound effect called disconnection syndrome. You should talk to your doctor whenever you have concerns. Q: How can fibromyalgia be prevented? A:　You should learn to pace yourself. It is necessary to build up your basic strength. Getting active and taking a plenty of rest will also help. It is important to get enough sleep, eat a balanced diet and do moderate exercise. Try to keep the balance. You also need to have sufficient time of relaxation. You should not keep looking back. Instead, you should look forward to the future and think about the meaning of your life. If you follow these tips, you will not develop fibromyalgia.